your cells free of debris. trampoline and your lymphatic system will thank you. The lymph really needs the "squeeze." haha Running is usually hard on the knees and the feet ........but it's an excellent form of exercise and I wish I could do it. Why tempt what is the obvious and if an elderly person can do the soft landing on a tramp, go for it. I run on the treadmill. I like it. I don't run outside. The cars on the country roads make me nervous. They can't see you coming up a hill until they're over it. I'm surprised so many don't seem worried about that at all... but to each his own, I always say sometimes. ;) :) :) Have a great weekend! I did not know this about trampolines! I would imagine it would be good for building bone strength too. Seems to be good for balance too. I just need stronger legs, period. I have been reading about this and I do have a small one out in the garage. Ceiling too low in the house and the house is old enough that I am not so sure jumping up and down would be so good for the joists. But, I can put it out on the driveway when it is nice out. My house is a very antique farm house. (Sounds better than calling it a dump, which is what it really is) LOL I have wondered too, if I could end up in the cellar. Outside would perfect on a nice day. Good to know. I did use mine this winter. I bounced during commercials. It was easy on my joints. Now days, gardening is my fitness program. Ouch. It will be mine too as soon as I get the garage empty. There, I'm just a broken record but I can see the ending. We bought a trampoline for the kids years ago, but dismantled it recently. The kids are grown and the thing made me queasy. I did like it when Mrs. Penwasser used it, though. But, she eventually got wise to me. We had a mini trampoline several years ago (6 maybe?) but no one bounced on it AND it was in the way. It was in the kitchen as I recall. So we got rid of it. Now I wish we still had it (after reading this). I was scared of trampolines in gym when I was 10, I think i'll skip this tip...actually, does skipping count? Hey, if you can skip, more power to you. Now at my age, I think that is harder than running. Ha skipping is so melodic. Well, then!! There are trampoline activity centers opening up in our area. I wonder if they have bars for one such as me? Susan, I've never been in one of those. Do they have all sizes ? I was thinking they would have a lot of the big huge ones like people have out in their back yard. In a city nearby, there is a trampoline--um business. What I mean by this is that inside you jump a lot. They probably have the large ones that you would keep out in the back yard. That would be fun. I'm almost positive we don't have anything like that here. Oh my gosh I'm like Robin I had one of those small trampolines and got rid of it. I did buy some Coconut Oil yesterday. 3 tablespoons of coconut oil a day will help keep alzheimers away. Congratulations, you are one of the coconut oil kids. I used to have one of those small trampoline's...they opened a big trampoline center around here and kids and adults are going there to bounce about. It must be good for blood flow.. I'm probably the one person to ever jump on a trampoline and to never have gotten hurt from my own stupidity. but I've had some close calls. Must be why some exercise programs start with jumping jacks. Both my mind and body balk at jumping, especially the knees. I notice that that the more warmed up I feel, the more willing I am to do jump. Great advice, I've not heard of this use for a trampoline before. Dropping in from the A to Z I have given your blog a shout out from my letter U today. Rosie Amber - Book reviewer. Campaigning to link more readers to writers. I might be safer skipping rope and still get the jumping in. Yeah! its really informative post, I knew here many things that I was not aware. 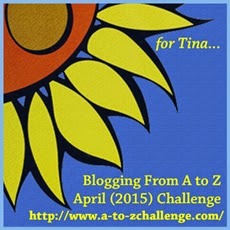 This A-Z challenge is also interesting. Got many things that should be helpful to discuss and I will share it. Good Job!